Elliott Bay Design Group (EBDG), a leading naval architecture and marine engineering firm with offices in Seattle, New Orleans and Ketchikan, Alaska, today announced that the new freight and passenger ferry it designed for the Woods Hole, Martha's Vineyard & Nantucket Steamship Authority (SSA) will be built at Conrad Shipyard in Morgan City, Louisiana. The new ferry, WOODS HOLE, will replace the M/V GOVERNOR, the oldest vessel in the SSA's fleet. The new single-ended vessel will measure approximately 235 feet, have a total person capacity of 384 and a car deck that accommodates 55 standard vehicles or 10 tractor-trailer vehicles. The ferry will include a bow thruster and have a service speed of 14.5 knots. The WOODS HOLE will provide service between the Massachusetts mainland, Nantucket and Martha's Vineyard. Construction of the vessel is expected to be complete in spring of 2016. EBDG previously designed the 255' ISLAND HOME for the Steamship Authority, an entity established by the Massachusetts state legislature to provide reliable transportation for residents to and from the islands of Nantucket and Martha's Vineyard. The WOODS HOLE project is the latest vessel to be built by Conrad Shipyard to one of EBDGs designs. The shipbuilder, which has a long-established presence in the Gulf Coast region going back to the 1940s, also built the passenger ferries SWAN QUARTER and SEA LEVEL, both designed by EBDG for the North Carolina Department of Transportation. Stated EBDG Vice-president of Engineering, Brian King: "We're pleased to be working once again with the Conrad Shipyard and the Steamship Authority, both of whom are valued partners of ours. 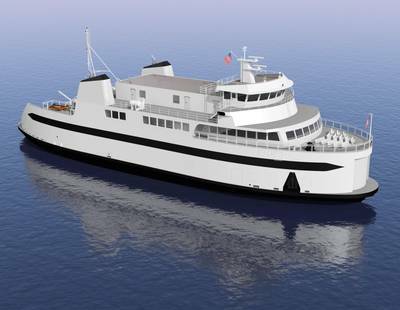 We're looking forward to the construction of this new vessel, its entering into service and the continued positive impact that will have on the Martha's Vineyard & Nantucket community."